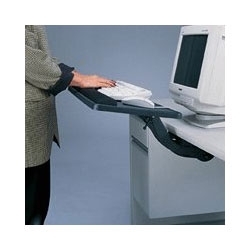 A keyboard tray that makes it possible to use your keyboard and mouse while seated or standing. The low-profile mechanism provides clearance for your knees. Simply lift and release the tray to adjust for 10-1/2" height range. Unit has a 30° tilt range: 15° positive and 15° negative reverse angle and full 360° rotation on a smooth operating 21" track with precision glides. The 28"W x 11-3/4"D keyboard platform includes a Black Therasoft wrist rest and provides space for right or left mousing. Black granite fleck finish. Meets BIFMA standards. I like this keyboard and mouse tray a lot, it has a large surface area and is quite sturdy. My computer is in the corner of my desk which is not idea; the tray must be wiggled around to go below the surface of the desk which would not be a problem if it was not in the corner.